On June 25 Senator Chris Dodd introduced the Peace Corps Improvement and Expansion Act of 2009 authorizing funding to double the number of volunteers within three years. "Inventiveness and duty: two qualities that don’t often go together. But the Peace Corps is the result of just such a combination. It has strengthened our nation, improved the world, and stands today as one of the signal accomplishments of the 20th century. Nothing has meant more in my life, or in the lives of so many others. To those who know and love the Peace Corps, reform is an uncomfortable subject. After all, we don’t want to destroy what has made this institution so remarkable and unique. There wouldn’t be a Peace Corps if JFK had stuck to the script in Ann Arbor. There wouldn’t be a Peace Corps if thousands of students, acting on their own initiative, hadn’t caught his attention with their movement. There might not be a Peace Corps if Sargent Shriver had listened to the respectable voices of caution. The Peace Corps is unlike any other organ of our government because of its uniquely grassroots origin. And we can’t treat it like any other organ of our government. So the Peace Corps Improvement and Expansion Act of 2009 does not include a list of mandates. It does not micromanage. Instead, it asks those who have written this remarkable success story – from the Director to managers and country directors to current and returned volunteers – to serve once more by undertaking a thorough assessment of the Peace Corps and developing a comprehensive strategic plan for reforming and revitalizing the organization." In a letter last week to Minnesota Representative Betty McCollum, Peace Corps Director Ron Tschetter said the Peace Corps doesn't anticipate that its funding bill will pass during this session, so the agency is trying to work within its current budget. It is also facing an estimated $8.7 million loss in fiscal year 2008 from the weakening dollar, and the tight budget could decrease the number of volunteers worldwide by up to 5 percent, or 400 people. "I would also like to take this opportunity to thank you again for your continuing support of the Peace Corps, particularly during the FY 2009 budget appropriations process. While I was certainly pleased to see the House Appropriations Subcommittee on State, Foreign Operations, and Related Programs provided the Peace Corps with the President's request ($343.5 million), it seems unlikely that many, if any, of the FY 2009 appropriations bills will be sent to the President before the end of this Congress. As such, the Peace Corps must prepare for a continuing resolution, which means the agency will likely be operating under its current FY 2008 budget of $330.8 million." 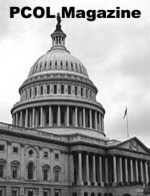 "Under a continuing resolution, the budgetary realities confronting the agency in FY 2009 appear especially daunting. Without full funding in FY 2009, we anticipate a significant impact on our capability to place more Volunteers overseas and to increase country programs. Furthermore, as the agency shared with Chairwoman Lowey's staff before the Subcommittee's consideration of the bill, the weakening of the dollar overseas in tandem with spiraling costs of basic commodities, both domestically and internationally, have materially reduced our available resources and spending power. We currently estimate foreign currency losses of almost $8.7 million for FY 2008. Tough budgetary decisions must be made now in order to ensure a financially healthy agency next fiscal year." "Next year is going to be challenging financially, as well, and we have kept the FY 2009 budget in mind and taken steps to reduce Peace Corps' base operating budget in order to strengthen our position moving forward. We need to assume we will be operating under an extended continuing resolution at the level of our current appropriation well into the next fiscal year. This environment shapes the financial decisions I will be making as FY 2009 budget marks are determined in the next few weeks." "As we prepare for FY 2009, it is important for us to remember that our core business is supporting the work of our Volunteers. The office budget marks will be lower than the FY2008 approved budgets, so we are all going to have to ask ourselves whether or not our financial decisions are in the best interest of our Volunteers. All of you should begin to streamline your operations in the last quarter of FY 2008 in preparation for FY 2009. I have dealt with many tight budgets in my career, and I know this is not easy. Each of you will have to work within a lower budget mark while maintaining mission-critical activities, such as postponing the filling of vacant positions, curbing travel for both you and your staff, and/or holding off on large expenditures." "I want to encourage you to be creative in looking at ways to save money. Discuss ideas within your offices and talk with Peace Corps colleagues whom you support to determine how you can best meet their needs in a more cost-effective manner. We are all fortunate to be a part of a remarkable organization that has seen solid growth over the past six years. We continue to play an important role in spreading world peace and friendship around the world. And just as we ask our Volunteers to be flexible and creative in carrying out their work, now it is time for us to do the same. I believe the Peace Corps is one of the best values the American taxpayers receives, and we owe it to them to continue our operations with sound fiscal management and a firm commitment to supporting our Volunteers, so that the agency remains in a healthy financial position not only in FY 2009, but beyond." Mark Gearan, president of Hobart & William Smith Colleges and former director of the U.S. Peace Corps, spoke at Cornell University in a speech titled, “Public Service in the 21st Century.” Gearan was invited to Cornell as a part of the 2006-07 Colloquium Series presented by The Cornell Institute for Public Affairs. Gearan asked those in the audience who are thinking about international development to look into becoming involved with the Peace Corps. “Allow me this commercial,” said Gearan, “to encourage you to think about the [U.S.] Peace Corps service.” Gearan said the satisfaction experienced by Peace Corps volunteers is nothing less than significant. Peace Corps volunteers make a 27 month commitment to the Corps. 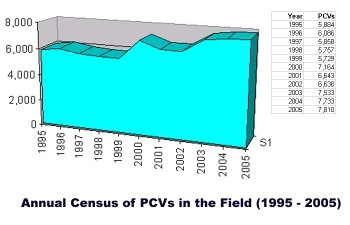 He conveyed that 9 out of 10 volunteers surveyed while working in the field would choose to volunteer again, while the same ratio of volunteers would recommend the experience to others. Gearan defined the term “public service” as being comprised of two parts: “community service and volunteerism aspect and a public service aspect” in regards to public service with federal and state governments. “When we look back at our past as Americans, there has been an ethic of service since our founding,” said Gearan. “From minutemen, to thee early founding fathers [who established] our country in the deep routes of freedom, to Alexis de Tocqueville who was struck by the efforts of [early American] ‘joiners,’ those getting involved in their communities and meeting houses, we have [historically] fostered this sense of volunteerism during times of crisis, war and peace,” said Gearan. When the room opened up for questions, an AmeriCorps alumna raised concern over the budget cuts of both the Peace Corp and AmeriCorps. “Funding is being slightly shaved off every year,” said Gearan. Because there is no one really fighting against it, there is also no one strongly fighting for it. “Without an engaged constituency [the Corps] suffers.” Read more. President Gearan’s appointment to Hobart and William Smith in 1999 made him one of the nation’s youngest college presidents. In the course of his tenure, he has reinforced the Colleges’ commitment to global understanding and study abroad opportunities, community service and service-learning, with the goal of providing these elements through contemporary facilities and state-of-the-art technology. When named president, Gearan was serving as director of the Peace Corps in Washington, D.C., a post he assumed in 1995. Under his leadership, the Peace Corps experienced a resurgence of interest. The Colleges also have progressed under his guidance. Prior to his Peace Corps directorship, President Gearan served at the White House as Assistant to the President and Director of Communications, as well as Deputy Chief of Staff during the Clinton administration. During the 1992 presidential campaign, he was Al Gore’s campaign manager, segueing to the position of Deputy Director of President-elect Clinton’s transition team. President Gearan serves on the boards of the Corporation for National and Community Service, which operates the community-based service programs AmeriCorps and ServiceCorps; and The Partnership of Public Service, a group aimed at encouraging young people to pursue federal service careers. Additionally, he served as chair of the National Campus Compact and he is also a member of the Independent College Fund of New York. Read more. 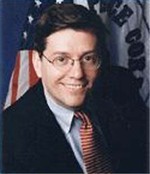 Read more about former Peace Corps Director Mark Gearan. President Bush has sent Congress a proposed $20.3 billion budget for foreign assistance during fiscal year 2008, which begins October 1. The funding request is part of the president’s $2.9 trillion budget plan submitted to Congress February 5. Congress must approve the president’s proposals and can modify the specific amounts requested. In turn, the president must approve the final appropriations bills that Congress passes. Under the proposal, the Peace Corps would receive $334 million, up $9 Million from the $325 Million Congress appropriated for FY2007. "This time of adversity offers a unique moment of opportunity, a moment we must seize to change our culture. Through the gathering momentum of millions of acts of service and decency and kindness, I know: We can overcome evil with greater good. And we have a great opportunity during this time of war to lead the world toward the values that will bring lasting peace. All fathers and mothers, in all societies, want their children to be educated and live free from poverty and violence. No people on earth yearn to be oppressed, or aspire to servitude, or eagerly await the midnight knock of the secret police." "And America needs citizens to extend the compassion of our country to every part of the world. So we will renew the promise of the Peace Corps, double its volunteers over the next five years, and ask it to join a new effort to encourage development, and education, and opportunity in the Islamic world." In his State of the Union addresses, President Bush has used the occasion, as do all presidents, to outline bold objectives for the coming years. Still another worthy goal, this one in his 2002 State of the Union address, was to double the number of Peace Corps workers by 2007. Bush rightly proposed expanding the Peace Corps started by President Kennedy in 1961. The Peace Corps shows the world the best of American values. Last year more than 7,500 Peace Corps volunteers served in 71 countries. They taught school, provided medical assistance, built houses, taught farming and did other good works. Many Americans transformed by the 9/11 terrorist attacks and wanting to help their country signed up for the Peace Corps. Applications jumped from more than 9,000 in 2001 to more than 11,000 last year. Countries seeking Peace Corps workers also soared. About 20 are on the waiting list for Peace Corps volunteers. But budgetary constraints mean an expanded Peace Corps will not happen. America's best face lacks funding. Promises not funded are promises not kept. 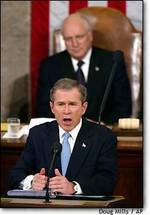 Is the Civilian Reserve just another throwaway applause line in Bush's State of the Union speech? President Bush's call last week for a Civilian Reserve Corps to help troubled countries is either a solid idea whose time has come or yet another throwaway applause line in a State of the Union speech and it's up to Mr. Bush to decide how it turns out. Five years ago, Bush called for doubling the size of the Peace Corps. That didn't happen. 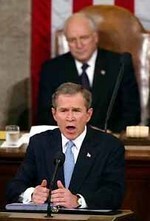 The burden is on Mr. Bush to prove he is serious. Carlos Pascual, who worked on the idea when he was director of the State Department's Office of Reconstruction and Stabilization, says the lack of specifics "is indicative of the lack of leadership around it, the lack of commitment." One test will be whether the White House funds it in next week's 2008 budget proposal. Mr. Bush's proposal last week found a mixed audience among bloggers, with some saying the idea is overdue, but others saying the details will matter. One blogger said he "was reminded of Police Academy 4: Citizens on Patrol," a comedy about bumbling police officers assigned to train a civilian force to fight crime. Mr. Pascual said the initial setup costs would be in the neighborhood of $150 million over a few years, and have a recurring cost of $50 million to $70 million. During a deployment, costs would go up, he said. The White House did request $25 million in the 2007 budget to get the program started, but Congress did not appropriate the funds. The concept has congressional supporters, including top Republicans and Democrats on the Senate Foreign Affairs Committee. The Senate last year passed by unanimous consent a bill that would have authorized the program, but it did not receive a vote in the House.